Zucchini is one of those vegetables that’s kind of hard to get excited about. It’s mild in flavor, spongey when raw, watery when cooked, and it does not know moderation. When zucchini grows, it grows abundantly and with enthusiasm, which is kind of adorable, but also pretty inconvenient. If pinterest is any indication, everyone is up to their eyeballs in zucchini right now, and fresh out of ideas for how to use it. Zucchini bread, grilled zucchini, zucchini gratin – the veggie is versatile for sure, there’s just way too much of it. And does anyone really want to bake in this weather? Gratins and breads are out for me, but grilling is something I can get behind. That slightly charred grill-flavor just screams summer. 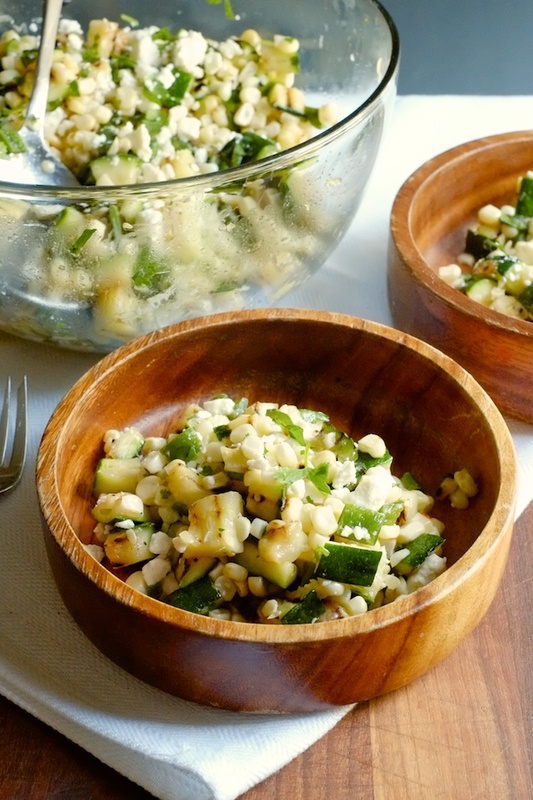 Add some sweet grilled corn, blistered poblanos, citrusy dressing and salty feta and I’m actually pretty stoked. It’s summer in a bowl. The grilled veggies retain a bit of their texture which makes for a more interesting and tasty salad if you ask me. A crave-worthy salad you’ll probably actually miss this winter. Get it while you can. 1. Whisk together lime, garlic, cilantro, olive oil, and honey in a mixing bowl to make dressing. Add salt and pepper to taste. 2. Cut zucchini into thick slabs (about 1/3 inch), brush with oil, sprinkle with salt, and grill over medium-high heat until well marked. 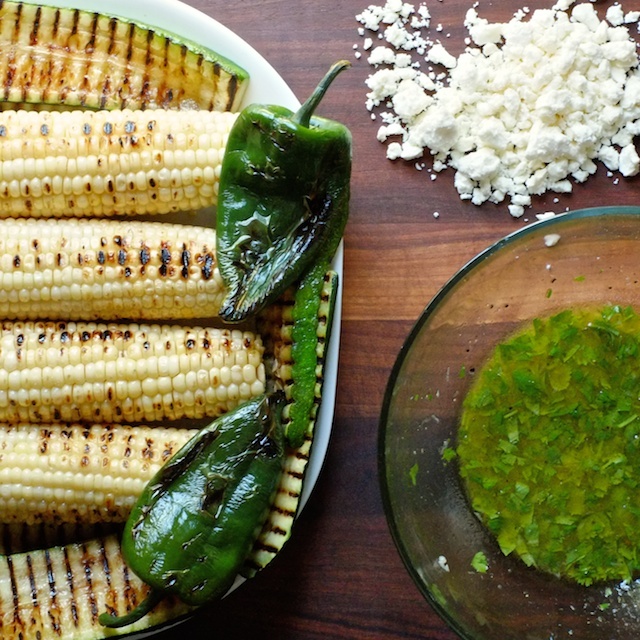 Brush corn with oil and grill until marked, and grill whole poblanos until blistered. 3. Peel papery skin off of blistered poblanos and cut the flesh away from the stems and seeds. 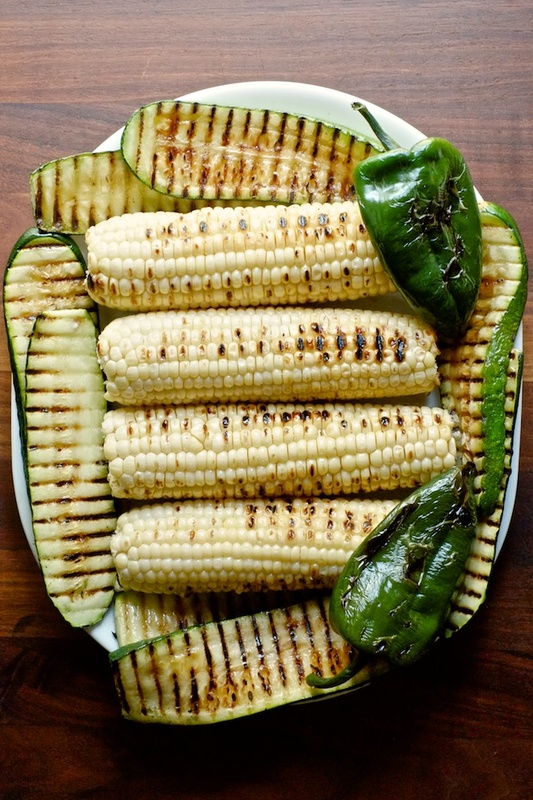 Dice poblanos and grilled zucchini, and cut the grilled corn away from their cobs. 4. 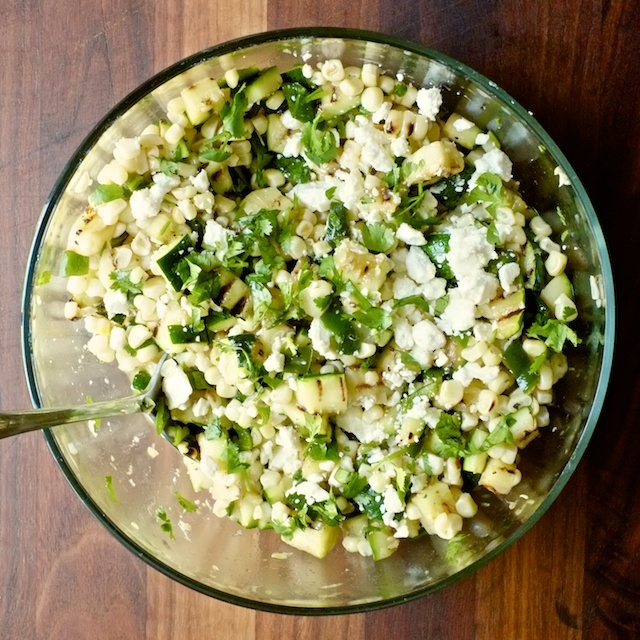 Add diced poblanos, zucchini, and corn to the honey lime dressing, toss to coat and add crumbled feta. Taste and add salt and pepper if necessary. This is meant to be a savory salad with sweetness in the background, so season accordingly. this looks so tasty i want to make it right now!!! of course we killed off our zucchini plant this year. what?? well, we have a few yellow zucchinis. those will work, too, right? Yellow squash would definitely work! This looks great - lovely and summery. 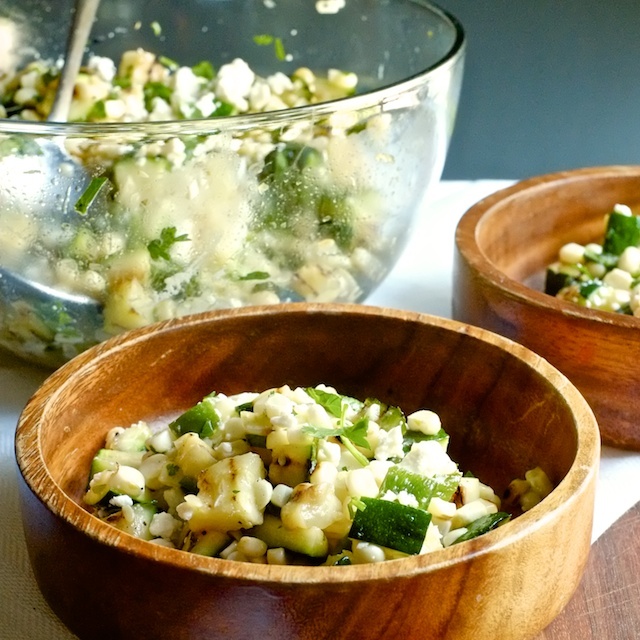 I love grilled corn salads. Will give this a try. Thanks! Thanks Geraldine! I hope you love it!